A Break From Winter - At Last! 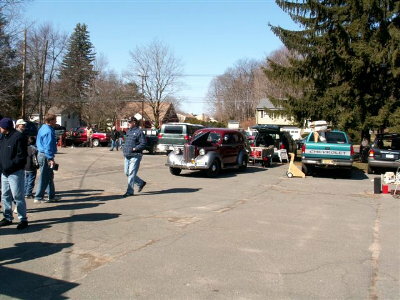 Once again Frank P’s Rocky Hill meet was a tremendous success. 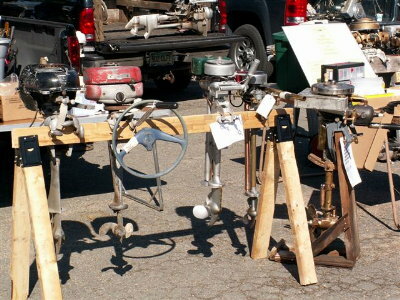 The lousy winter weather issues that plagued other meets created a pent-up demand for things old-outboard related. An all-time record number of people attended the meet, the sign-in was 94 names! Cars were parked in two and some places three rows. 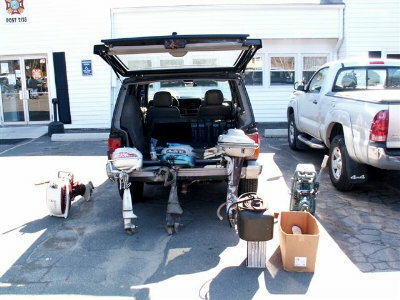 There were literally tons of outboards and parts for sale. 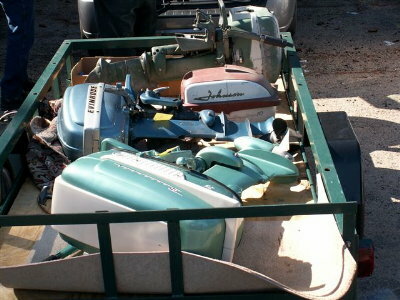 Obviously lots of people have been out beating the bushes to find old outboards over the past few months. And many people, (like this writer), cleared out a few back-row projects to make room for some new ones! 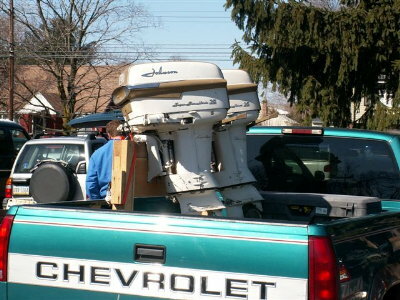 There is no explanation but sometimes one type of outboard or brand will dominate a meet. You will go years without seeing a Caille, Martin, Oliver, etc.. and then one day POW!! There will be several of them at one of our gatherings. This was the meet of pre-war Evinrudes. 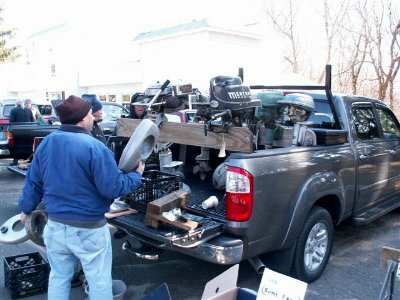 The oldest outboard this writer spied for sale was Lenny R’s Evinrude RBM (1921?) that went home with a new owner. There was a very handsome 1927 Evinrude Model N that went home with Rick P. and young Hurricane Harry S. broke with tradition and purchased a non-mercury outboard; a 1929 Evinrude Folding N. (A very worthy project!) 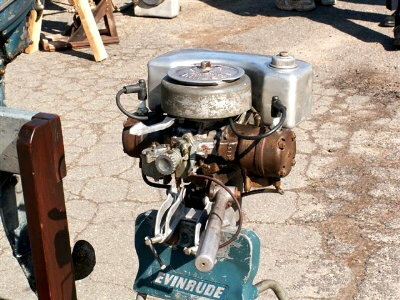 There were several Ruddertwins and at least three other late 20’s and early 1930’s Evinrude or Elto knob start twins that changed hands. (They were snapped up so fast that an ID was impossible) There were two of the same model 1931 Evinrude battery ignition model 401 twins, Joe R’s was nicely restored and Gary M had a fine barn-fresh example. 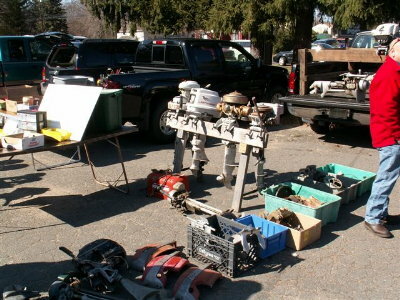 Not to say there weren’t plenty of other outboards, there was a tub with 74% of a Caille Liberty Drive single in parts. 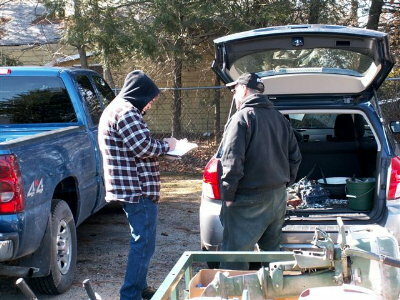 Another project was the 1930 Johnson A-50, (one of the first alternate firing Johnson outboards), purchased by Kevin S. Kevin also found a very rough powerhead and rope plate to a 1924 Johnson Model D – this is reported to be a rare salt-water canoe motor. 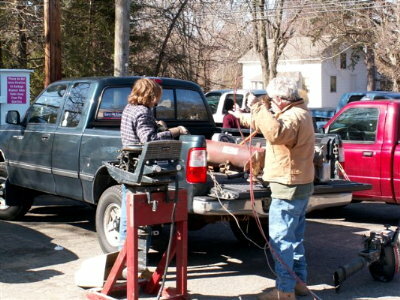 (Even Bob Z - Mr. Johnson Outboards - was impressed!) Lots of Johnson motors from the 30’s changed hands, plenty of LTs and DTs and an unusual 1937 Model LS single that was complete including the sparkplug cover. 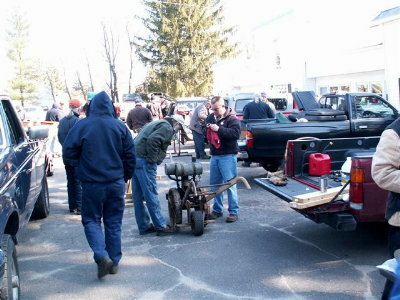 The usual 1950’s motors turned up, of note was a beautiful restored 25hp Buccaneer that Norm D. was offering for sale. Spied were a matched pair of 1958 Johnson Javelins but if they were for sale, purchased or just on display was unclear. Quite a few Martin 40s and 60s turned up. One Marin 60 went home for $50, was complete including the cowl and was later reported to have fired right up with only a splash of fuel! And a certain member from NJ ended up with a carload of Lauson T-653 twin parts, hopefully enough bits in the 3 boxes to put together one example! An interesting display was Brook N’s working Merry Garden Tractor. Made in Cleveland OH by the Atlantic Machinery & Manufacturing Company, it used an Evinrude row boat motor powerhead! Brook cut about 4 miles of furrows in the parking lot throughout the day. (Okay, he was PRETENDING to till the parking lot!) Inside the VFW hall Walt L set up a fabulous display showing the toy outboard collection of the late Gary Merz, past President of the Yankee Chapter. I think virtually every K&O miniature was represented, my favorite is the Scott 33! 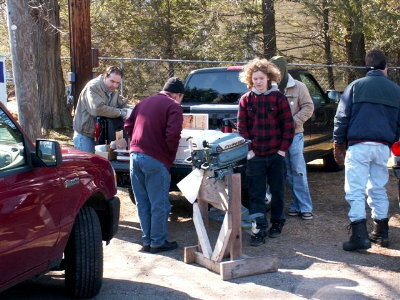 Once again our host donated two outboards and Lowes gift certificate for the raffle. The motors were a fine looking Neptune 15B4 and a barn-fresh Chris Craft Challenger. The Neptune was won by Lenny R (who owned that very motor before Frank!) and Carl R. Jr. took home the Challenger. 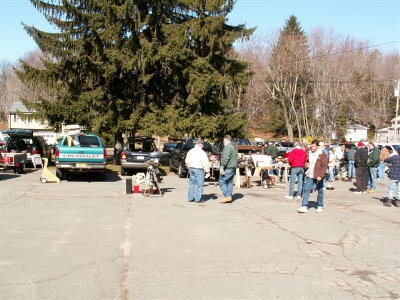 Thanks again to the Rocky Hill VFW for the use of their hall, the excellent coffee, hot dogs and burgers. And a tremendous THANK YOU to Frank P for organizing and hosting the meet and donating the prizes for the raffle! Thanks to Frank P. and Norm W. who contributed the photos below! 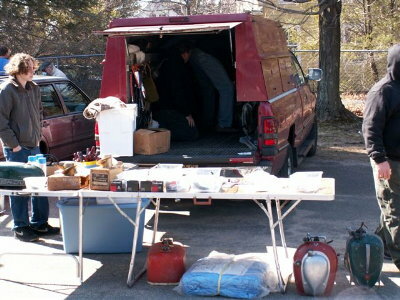 Rich C had plenty of old stuff for sale! Ruel E. eyes a new mailbox! 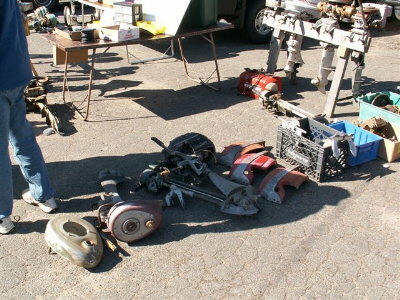 Norm D. with lot's of 1950's OMC stuff. The restored Buccaneer 25hp was stunning. Norm & Bill working on a deal. 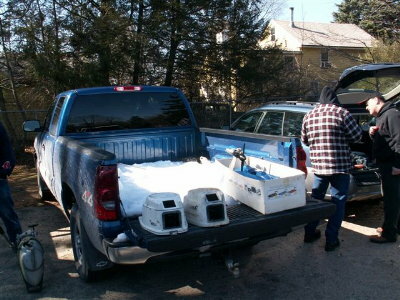 In addition to the two 5 1/2 Johnson hoods, this truck offered free snow imported from New Hampshire. 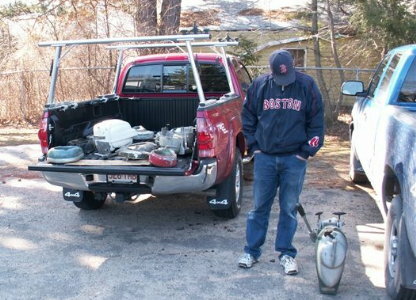 This Red Sox fan needs that Mark 25! Gary M eyes a Champion fuel tank. Brook N's Merry Garden Tractor was powered by an Evinrude rowboat motor engine. It made many trips up & down the parking lot chuffing & wheezing! Do you need a Martin 40???? The two boxes with the Merc cowls hanging on them are full of Caille Liberty Drive parts! The prize Neptune was Lenny's, then Frank's and now it is Lenny's again! Cool home made gas tank! Rick P. picked up this very nice looking 1928 Evinrude Model N Sportwin. This model N's serial number shows it to be one of only 250 produced in the 1928 model year - Tillotson carb is correct for that model year. Team Maffei checks out some bargains! Michael S. and Kevin S. look at the $50 Martin 60. Kevin took it home, added gas and it started right up! Who is going to win the raffle - the suspense is terrible! Bob G. signing for the folk's with hearing damage from running those old Mercurys! Carl R. Jr. wins the Chris Craft! 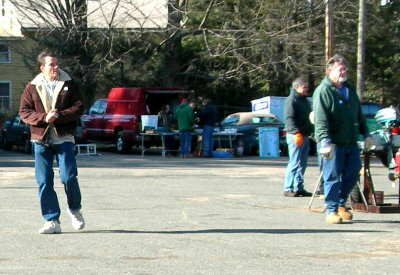 Frank (L) applauds Lenny (R) for winning the Neptune back!